The Sugar and Cover originally debuted in 1915. 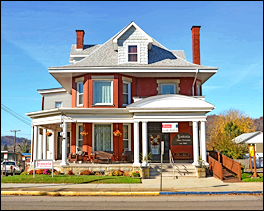 Decades later, Fostoria modified the name to “Sugar and Cover” and/or a “Candy Jar and Cover”. Many folks refer to this piece as a “Barrel Sugar” – simply because of its appearance. 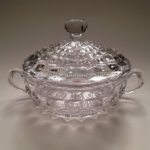 Whatever name you prefer, this beautiful piece will serve sugar, candy, and an assortment of other food items – in grand style. 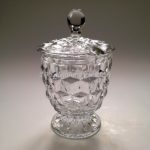 Of all the sugar servers produced in Fostoria’s American pattern, this Sugar and Cover is the tallest. It is about 6¼” tall, measured with the Cover on. My own personal piece measures 6½” in height. Slight size variations are to be expected, especially when you consider that all the American items were handmade. 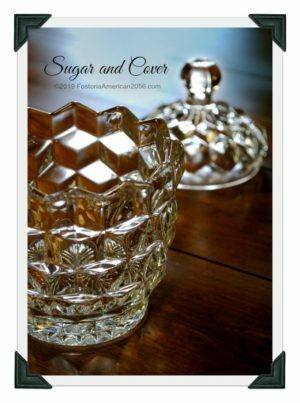 In my scrapbook of Fostoria memories and treasures, the Sugar and Cover is one of my most favorite American pieces. 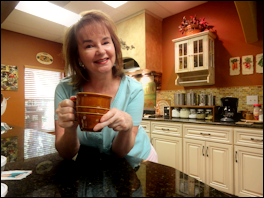 I like the fact that it is versatile in purpose – being able to use it for serving both sugar and/or candy. 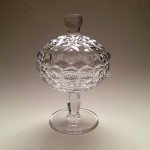 It also is not as common as the other sugar servers in the American pattern, so there is a bit of mystery behind it. In the original 1915 Fostoria American Catalog Supplement, it was this Sugar and Cover that was predominately featured next to the Cream Pitcher. 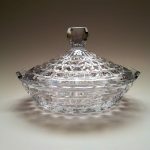 Fostoria also produced (circa 1915) a smaller Individual Sugar, without a lid. 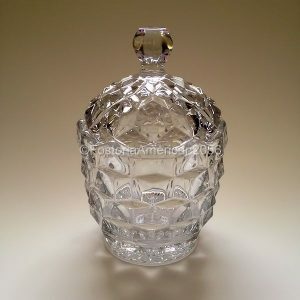 The Handled Sugar and Cover came into production later. Please click the following sponsored link for available Sugar and Covers on eBay. Since people sometimes refer to this item by different names, you might need to modify your search terms accordingly.